So simple and so tasty! Cook the baby potatoes in a pan with some water until just tender, this will take 8–10 minutes. Then strain and set aside. When the potatoes have cooled slightly, cut each in half. Place the sliced vegetables into a bowl and toss with some olive oil and the oregano. 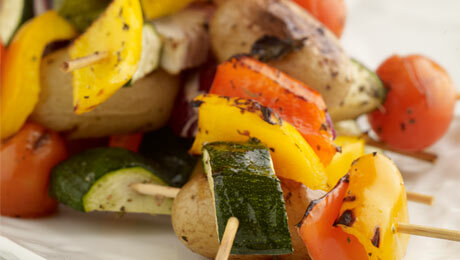 Thread on to eight skewers, then cook for 8–10 minutes, turning occasionally, until lightly charred and tender.